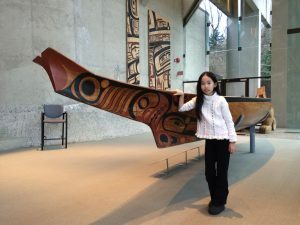 A few days ago, my family and I went to Vancouver, British Columbia. In Vancouver, we went to The Museum of Anthropology (MOA), in the University of British Columbia. 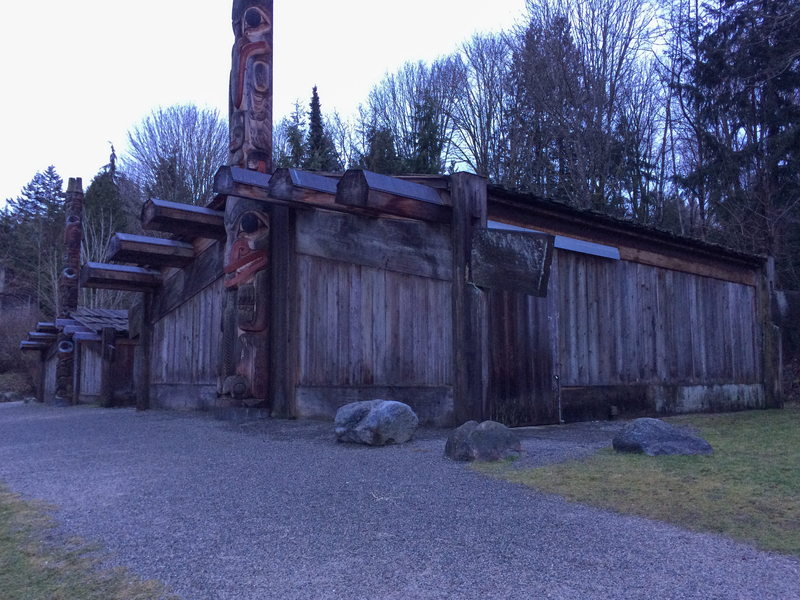 The museum contained many relics of the cultures of the First Nations that lived in that area. We went on a tour of the museum. 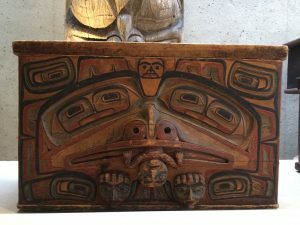 The curator mentioned a few of the many First Nation tribes that lived in the British Columbia area, then showed us the differences between the art styles of the tribes. The carvings of one tribe were very realistic and they were carved so deeply, that the sculpture was three dimensional. It was easy to tell what animal the carvers had depicted. The next tribe had carved more shallowly and it was harder to tell what animal the carvers had carved. The last tribe we looked at had carved very shallowly into the wood, and, it was nearly impossible for me to tell what animal they had carved! I noticed that since the sculptures were carved out of wood, some of the bottom of the sculptures had rotted away or been eaten by ants. 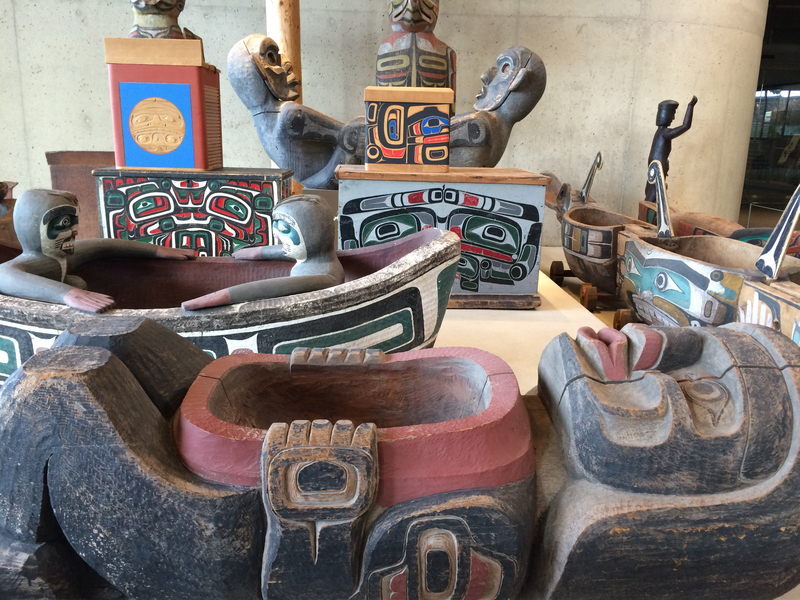 Then the curator told us that the First Nations got together annually for a celebration called potlatch. Besides feasting, they also sorted out their affairs, celebrated marriages, and reported crimes. The First Nations didn’t have written law, so potlatches were how they kept everything in order. The curator showed us huge tubs which the First Nations used to serve food. 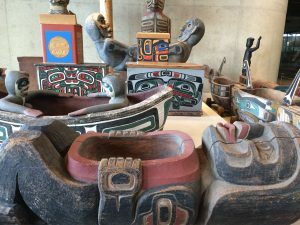 There was one set of serving tubs that were linked together, the tubs had wheels and were sculpted in the shape of a snake. The tongue of the snake was cleverly made so that if someone pulled the tongue, it would come out and could be used as a giant spoon! 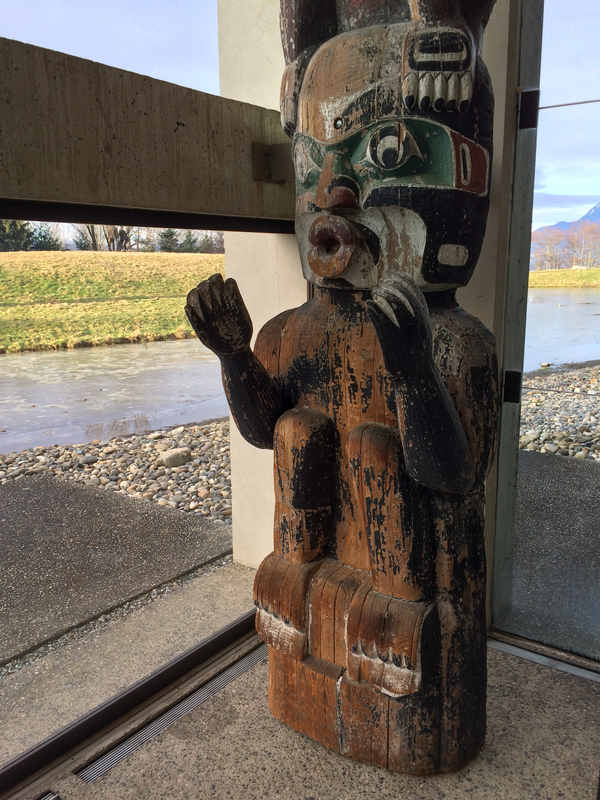 Then we saw some totem poles. 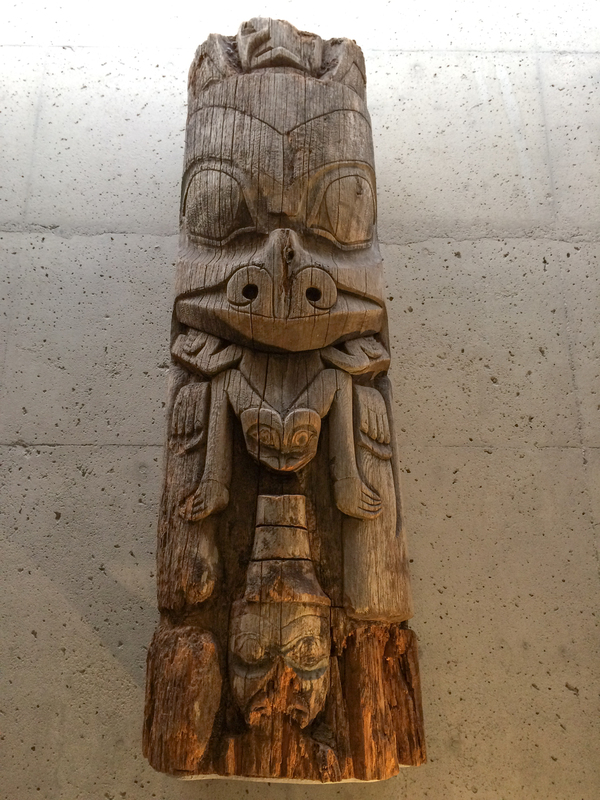 The carvings on the poles were based on the family history and stories. The stories were kept private among family members; only the family themselves could tell the tales carved onto the poles. 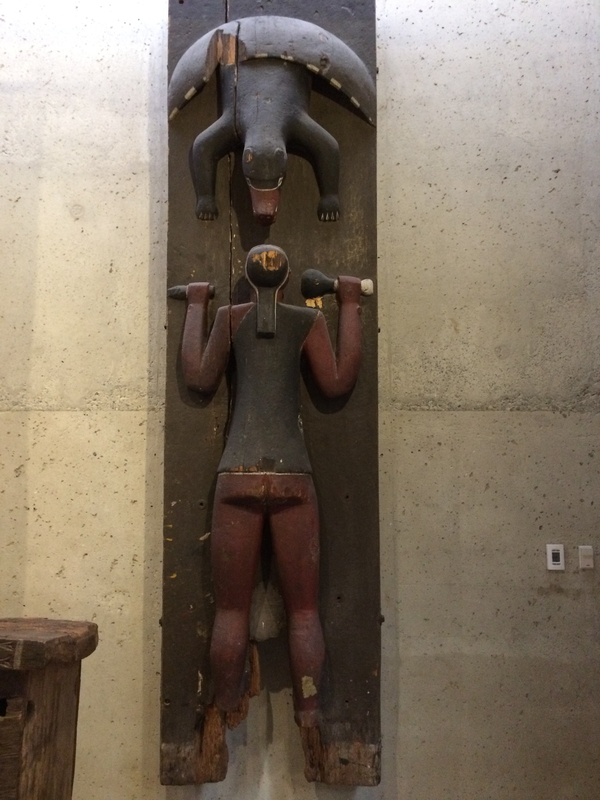 There were animals, like ravens and bears on the poles. Then we looked at some bentwood boxes. Bentwood boxes were made with a long plank of the very flexible Western Red Cedar, which was steamed to be made even more flexible. Then the cedar wood was bended into a box shape. This made three edges of the box, and the fourth was nailed together with wooden pegs. The bottom was probably attached the same way. 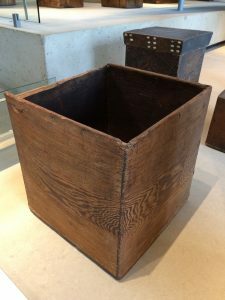 These boxes stored food and clothing, and were used as burial boxes! I wouldn’t really want to be stuffed into one of them! I also saw a canoe which was made by hollowing out a large log of Western Red Cedar. 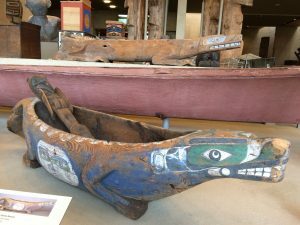 Then the artist smoothed the inside and outside of the canoe, added seats, and then painted it. 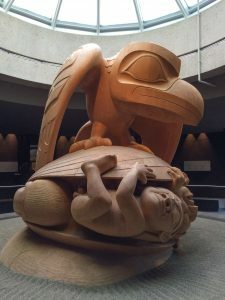 The artist’s name was Bill Reid, he was a goldsmith, carver, sculptor, writer, spokesman, and artist. We also looked at a famous sculpture called The Raven and the First Men by Bill Reid. Raven has just found the first men hiding inside a huge clam shell. 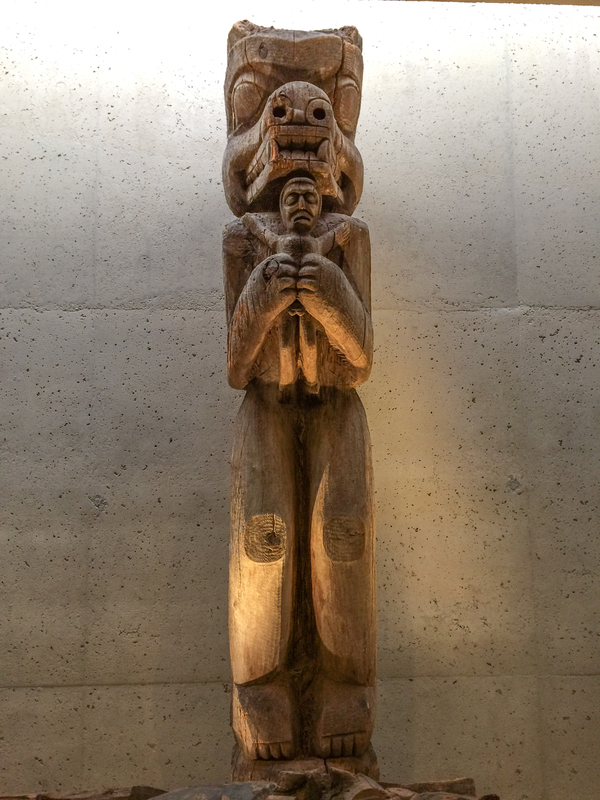 He finally convinces the men to come out, and they become the first Haida People (a First Nation tribe). 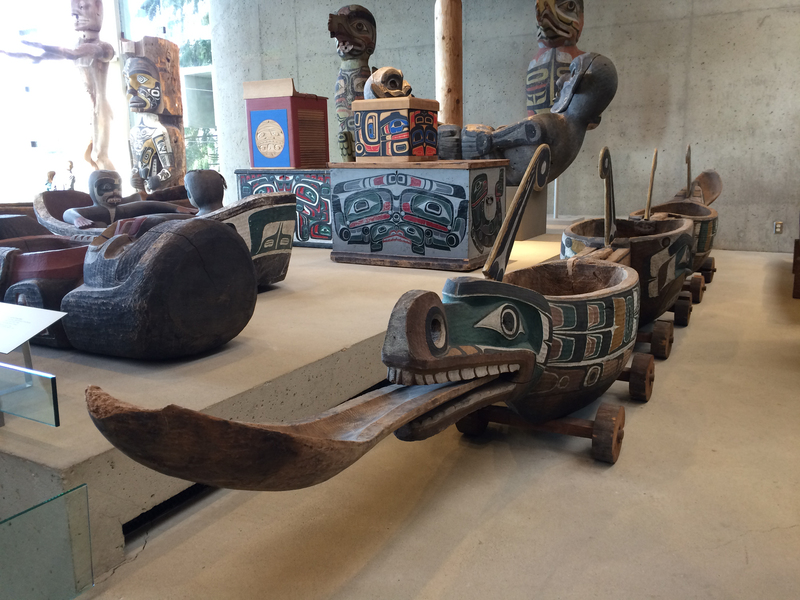 This trip to the anthropology museum opened a window to the First Nations, that I had never even heard of! I bought a dream catcher necklace in the museum shop. Dream catchers were used by some tribes who believed that dreams floated around in the air. Dream catchers were supposed to catch the bad dreams and hold them captive until dawn, when the first rays of the sun would annihilate the nightmares. I have not had any nightmares since!